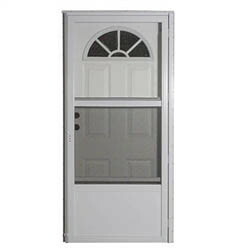 Mounted self-storing storm door is all aluminum with white durable finish. All of our storm doors feature safety glass panels. Bottom glass panel slides up and locks in place when fresh air is required. Bottom screen remains in place when bottom glass is raised. Self storing storm doors are available on all sizes. Storm door hardware is available in both white or black finish. See our door hardware section to order.